In the article below, Khushal of House of Gems shares an overview of some of the many many beads to choose from when planning out your designs. There are so many types of jewelry making beads to choose from that any designer can be overwhelmed. Before choosing your beads it helps to be clear about what you're making. Are you making junk jewelry or is this high fashion? Are your designs 'alternative chic' or are they 'vintage classic'? The ancient people, as you may be aware, used bones and shells among other organic materials as beads. Today's generation has the luxury to choose between glass beads, gemstone beads, natural beads, pearl beads and metal beads. Even more fascinating is the opportunity to choose between those produced in a factory and handmade beads. 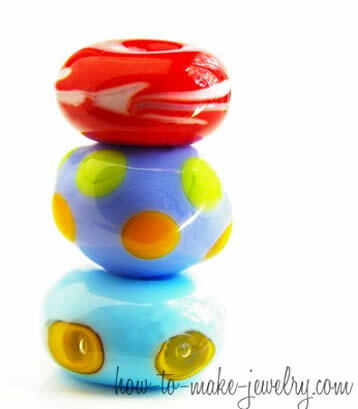 Glass beads are smooth and polished. They have an arty appeal, but you can also find crystals which are just the opposite. Faceted crystals have a glamorous allure and a shimmer. Glass beads are translucent; their cut affects the way in which they reflect light. These beads are affordable but upmarket; especially lampwork beads which are usually handmade (see image at the top of this page). Lampwork beads sometimes have protuberances; they are unquestionably the most innovative beads in the market. They come in a great variety of colors, with designs on the inside and outside. 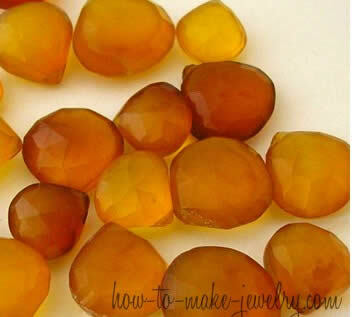 Gemstone beads are sophisticated and refined. They are semi-precious stones made of minerals or other organic materials. Quartz, Emerald, Jade, Sapphire, Ruby, Tourmaline, Amethyst; you name it. They are cut beautifully and are available in exquisite shapes. These beads are usually worn for their metaphysical properties. Many gemstones have healing attributes and cosmological traits. They are known to connect the wearer to divinity, and balance energies and emotions. Glossy globules, faceted drops or asymmetrical beads; gemstones are what the most regal pieces of jewelry are made of. 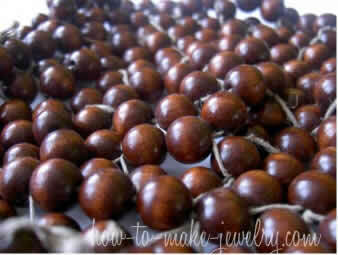 Jewelry making beads such as bone beads, wood beads and clay beads are called natural beads. Other organic materials used for beadwork include seeds, shells, coral and ivory. Textured bone beads are generally brownish with interesting shapes, they have an ethnic dynamism. Wood beads are light and chic; they are available in earthy tones and vibrant shades. Ceramic-clay beads have a glossy finish and a gypsy-like flair. Natural beads allow you to swing between Tribal and Bohemian styles. They are perfect for costume jewelry and look exceptionally young; besides, they don't cost much. Pearls are timeless, they have been associated with purity and sincerity since they were first discovered. Pearl beads come in two varieties; freshwater pearl and manmade pearl. Freshwater pearl is cultured; it is formed naturally in a mollusk owing to human interference. Man-made pearl on the other hand, is made with synthetic materials in a factory. If you want a perfect round, you might have to opt for manmade pearls. Freshwater pearls come in irregular shapes such as buttons, coins, crosses, and diamonds. Keishi and Biwa pearls are popular. You can also look forward to metal beads. They are generally made from precious metals such as gold and silver, but you can find base metal beads in the market too. Mid-range copper beads and brass beads are an excellent option. They make attractive charms but they can also be used as spacers for fashion jewelry. 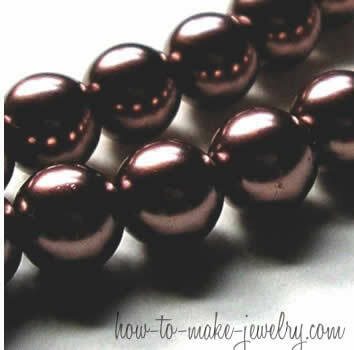 Whether you are making a bracelet, an earring or a necklace; beads are an indispensible element. 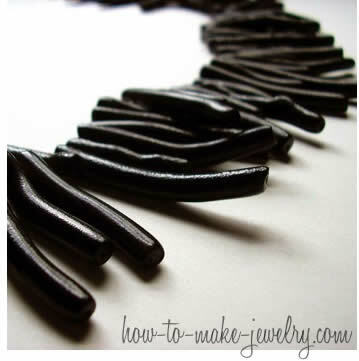 It helps if you know what you are trying to convey with your jewelry, since there are so many options out there. You will surely be surprised by the many shapes, sizes, textures and colors of your favorite beads. Remember, when choosing beads for your jewelry designs, be sure you understand who your potential customer is, what they love to wear, and how they love to feel in your jewelry, and to always choose appropriate colors for your customers' age and style. Purchase jewelry making beads and other beading wonders at reasonable rates online. Get clicking now!